When it comes to their art teacher Lisa Fine, Billings Central Catholic High seniors Faith Williams and Morgan Lee emphasized the unwavering support she offers her students. 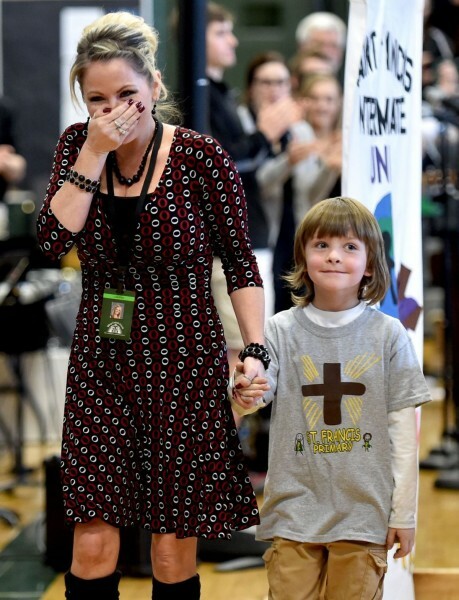 At Billings Central on Friday morning that support was given back to Fine as a packed gym cheered and clapped when Billings Catholic Schools President Shaun Harrington announced her as the 2017 Billings Catholic Schools Educator of the Year. Fine, who grew up in Sitka, Alaska, said it was through luck that she became involved with Billings Catholic Schools when she was assigned to student teach at St. Francis Upper School as she completed her studies at Montana State University Billings roughly 17 years ago. Eventually Fine would teach English, science, social studies and art at the middle school level for BCS before moving onto Billings Central where she teaches art full time. Fine said while teaching other subjects she always tried to find ways to incorporate art to help them learn in an engaging and welcoming way. She said her four sons — Braxton Ferraguti, Macen Ferraguti, Ryder Wilber and Gage Wilber — and her husband Scott Wilber, are important parts of her life. With Ryder in kindergarten and Gage only 5 years old, Fine said high schoolers Braxton and Macen have been particularly active in their support of the projects inside and outside of Billings Central that she undertakes. “You don’t always get to be the mom of kids that support you no matter what,” she said. Asked about her energy and her positive outlook, Fines said the former comes from her students and the latter from her belief and faith in Jesus Christ. “I just want them to know that they’re loved and that no matter what goes on with the rest of the day, they still have someone in their corner,” Fine said of her students. Both Williams and Lee, who intend to study art in college, said their teacher has shown them how to find art in unexpected places. “Everything’s beautiful as long as you see it in the right light,” Fine said of the outlook she’s shared with students. Several other people and organizations were honored at the BCS Awards of Excellence ceremony following an all-schools Mass on Friday morning. Bob and Penni Nance, Brian and Amy Cebull, the Nance Family Foundation and Nance Resources were honored as the BCS 2017 Philanthropists of the Year and credited with providing nearly $1.5 million to toward the educational and technological needs of students and staff. Rocky Mountain College was honored as the BCS 2017 Community Partner of the Year and thanked for providing the Billings Central Rams football team with a nighttime football venue in the form of RMC’s Herb Klindt Field, in addition to providing scholarships and allowing the use of a theater, basketball courts, soccer fields and classrooms. Bev Borer, who was credited with providing more than 50 years of altar service training at St. Piux X Church, was named the 2017 BCS Volunteer of the Year. The 2017 BCS Outstanding Support Staff award was given to Betty Reid. The 2017 BCS Outstanding Alumnus award was given to Joe Clark, for his role as project manager for the new St. Francis K-8 school that is currently under construction. The Billings Catholic Schools Legacy Award was given to Ralph Studer Jr. for his and his family’s longtime commitment to Billings Catholic Schools.